Your visit begins at Sprague Station, at the end of River Street in East Haven, where you purchase your tickets and learn about trolley history and technology in the indoor exhibit rooms. 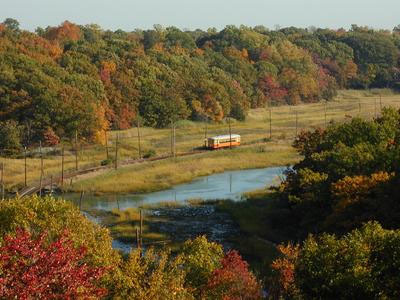 Then proceed outside and board one of our restored historic trolley cars for a trip down the scenic Branford Electric Railway! It’s a journey back in time you will not soon forget! Hear the sounds of steel on steel as you smell the sweet aroma of the shoreline salt marsh and view wildlife such as the majestic osprey. Children help the Motorman prepare the trolley for the trip. During the trip, your trolley operator will show you restored trolleys in our collection and explain how they shaped America as we know it today. This leisurely adventure takes you away from the hustle and bustle of modern day life. Bring a picnic lunch to our picnic grove. This wonderful nearby attraction is fun for Motormen and women of all ages. Your ticket is good on all trolley cars for the entire day, so ride as much as you like! We recommend that you arrive at least 10-15 minutes before your desired departure time. Trolley cars depart the station building regularly throughout the day, beginning at 11AM. Last car departs at 4PM. Due to the nature of our working railway, maintenance and other operations may dictate that we deviate from the posted schedule from time to time. We appreciate your understanding. Our railway operates with historic trolley equipment, all of which dates from an era long before the Americans with Disabilities Act. As authentic historic artifacts, the trolley cars have not been modified. Passengers board the trolleys knowing they will need to climb 2-3 steps to get aboard each car. Visitors with mobility disabilities who choose not to ride the trolley may still enjoy the indoor exhibits, restrooms, and other facilities in our fully-accessible Sprague Station building.